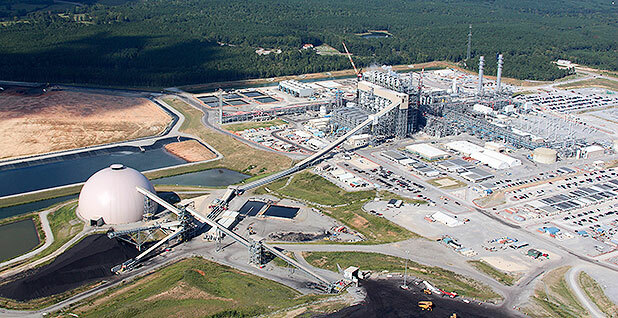 Southern Co.'s $7.5 billion clean coal plant in Mississippi should run as a natural gas plant, state regulators said yesterday, throwing a gut punch to the utility's hopes of recovering billions of dollars in cost overruns and paving the way for next-generation coal plants. The Kemper County Energy Facility would be the first large coal-burning power plant in the United States to capture and store the majority of its carbon dioxide emissions. The power plant is supposed to gasify lignite coal into synthetic gas, capturing the CO2 for use in enhanced oil recovery. The plant has been running on natural gas for years, and each of Kemper's two gasifiers has successfully produced electricity from synthetic gas. But Mississippi Power, the Southern Co. unit building the plant, has struggled to keep the plant's complex systems running nonstop. That has delayed its full startup. The surprisingly aggressive move by the three-member panel of Mississippi regulators is a significant financial and political setback for Southern, which has promoted the idea of building a first-of-its-kind clean coal plant at scale. Mississippi Power, for its part, could be stuck with a massive bill the state won't allow it to pass on to electricity customers. Instead, the state Public Service Commission wants the utility to plan on running on gas. Kemper originally was supposed to be operating in 2014, and its original price tag was a little under $3 billion. Now at $7.5 billion and a projected startup date of the end of the month, Kemper is at a crossroads. Mississippi Power filed a new rate plan for Kemper at the beginning of the month, as required by the PSC, but the utility had to hold off on formally asking to collect $4.3 billion from customers because the plant is not yet operating. It was that rate filing that triggered the commission's response, which came after a special meeting and a closed executive session. The PSC directed the utility to work with the staff attorney and other stakeholders to come up with a settlement within 45 days. The settlement should allow Kemper to operate on natural gas only and not raise customer rates, the commission said. What's more, Mississippi Power should find a way to lower rates, especially for its residential class of customers. "No rate increases, period," said PSC Chairman Brandon Presley. "And, none of the gasifier assets will ever be included in rate base." The PSC is scheduled to review an order addressing its directives at a July meeting. "It's obvious to anybody that this project has had its challenges," Presley said. "Because they made the rate filing, we felt it was time for the commission to give guidance to what we felt the public interest is." If the utility and PSC staff cannot negotiate a settlement within 45 days, "we'll resort to other options," Presley said. "We look forward to reviewing the order," Mississippi Power replied after the PSC meeting. The ability to run nonstop as a clean coal plant is key for the utility to recoup costs from customers under its current regulatory certificate. As a result, the project's operation date has been moved several times including a series of one-month delays that started at the end of last year. "I applaud the Mississippi Public Service Commissioners with their decision today to pull the plug on big bets gone bad, which has resulted in the most expensive power plant built in the United States that still does not run as advertised," said Louie Miller, state director for the Sierra Club's Mississippi chapter. Kemper has operated for about 200 days using lignite, according to Mississippi Power. But the company said it may need to redesign a critical part for its next-generation coal power plant, and that may take 18 months to two years to complete. "If the project isn't working at this point in time, it's not surprising that the commission is concerned about ratepayers paying for it," said Paul Patterson, a utility analyst with Glenrock Associates LLC. Patterson said he doesn't think it means the utility cannot recover all of the costs in question. But it has to work out those details with the PSC staff and other stakeholders. "The real question can be whether they will reach a settlement or whether there will be some litigation," he said. Not being able to recover the bulk of the outstanding costs could cripple Mississippi Power financially. Regulators agreed to $159 million in emergency rate relief in August 2015 after the utility's CEO testified that the company was on the brink of bankruptcy and would run out of cash by the end of the year. Kemper was running as a natural gas plant at that time. Costs continued to rise, and an earlier settlement with regulators capped what the utility eventually could ask to recover from its customers. That agreement, in part, has led to Southern's shareholders absorbing roughly $3 billion from Kemper at this point. Mississippi Power's current liabilities exceeded current assets by about $1.2 billion as of the end of March, according to a recent Securities and Exchange Commission filing. "Southern intends to provide Mississippi Power with loans and/or equity contributions sufficient to fund the remaining indebtedness scheduled to mature and other cash needs over the next 12 months" if sufficient funds are not available from external sources, the filing said.